The Tide Mill is an immaculately crafted work of period fiction where love, pain, gritty daily detail, natural beauty, and human ingenuity meld seamlessly into something almost epic. The depth and richness of Herley’s language is always a treat: through his writing, he constantly reminds the reader that the perfect word for the situation is not always the common or expected word. As terse and economical as his prose is, he seems bent on selecting every word for maximum impact, and succeeds over and over again, achieving an exhilarating mix of fast-moving action and rich detail. 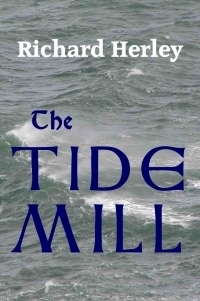 Herley is one of the few authors who can send me scrambling for the dictionary without seeming as if he’s showing off.Much like the other books of Herley’s that I’ve read, The Tide Mill inspires not primarily because of the ending – which is never uniformly sweet in his books – but because of the characters’ personal journeys. Herley’s protagonists are never static. They err, fail, learn, grow, and eventually achieve a kind of personal redemption that is utterly believable, and The Tide Mill's Ralf Grigg is no exception to this rule.The Tide Mill is also a love letter to England. Not the urban, tourist England of Big Ben and Buckingham Palace, but a wild, unspoiled place that I’ve never seen but, thanks to Herley’s powers of description, I feel I know. This is another running theme in Herley’s books: in The Penal Colony, the protagonist had to be exiled from civilization to find and appreciate it; in Refuge, it took the death of virtually every human on earth. Even in The Tide Mill, set in a time when England was far more sparsely populated, there’s a hint of mistrust of the city, and a naked affection for the flora, fauna, and geography of the land.As always, Herley’s level of detail and knowledge of his setting and subject immerse the reader in the world of the story, without ever resorting to didactic, 20 page long "research dumps" - the exposition always propels the story along, rather than slowing it down. Above all, Herley is a craftsman: you feel that he knows his subject, his story, and his characters perfectly, and that every sentence of every paragraph has been meticulously honed. I was shocked to find out that The Tide Mill and Refuge were self-edited, because the pacing and continuity, normally the most obvious victims of self-edited novels, are virtually flawless here. The word "perfectionist" comes to mind.This is my favorite book of all the ones I’ve read this year, and given the assortment of #1 bestsellers, genre essentials, and literary classics that that entails, I think that’s the highest praise I could give it. If there's a flaw with this book, it's that it's not long enough. There were more stories to be told in this universe.The story is intricately woven, though some of the foreshadowing is evident throughout the book. The level of detail and research conducted by the author is incredible, and made me reach for my Google machine more than once--which doesn't happen that often. Kudos to the author for a compelling, deeply readable book. The Tide Mill is a beautifully crafted and very moving immersion into the lives of two families in England during the reign of Henry III. Herley brought me right into the mind of a Baron of the realm, trying to manage an increasingly penniless manor and his family. At the same time he introduces the family of a proud shipwright, a freeman and his family, especially his gifted son. The two families become deeply connected through a courageous act of the young freeman which eventually brings him into the sphere of the Baron's youngest daughter. Their love is tragically star-crossed, and what might seem to be a typical story is so skillfully woven through the tapestry of the time and the construction of a highly controversial technology -- the tide mill of the title, it seems completely fresh. The idea of the young freeman, the mill pits the Baron against not only the Bishop, but against his ability to absorb a risk of everything he owns. The author is very thorough in his depiction of life within the manor hall, as well as the tiny parlor of the freeman's cottage. The texture and the emotions of all the interconnected characters feel immediate and completely honest, right down to the very satisfying conclusion. This is as great a masterwork in Historical Fiction as I have had the pleasure to read. I've always been a tinkerer myself, and was particularly taken by the detailed passages describing the construction of the mill itself. I recommend it to anyone with an interest in the period and wonderful prose. My first Herley read, it won't be my last. I greatly enjoyed Richard Herley's The Penal Colony and Dismemberment. The Tide Mill was a page turner for me, but I found myself skipping through several sections. I learned a lot about 13th Century serfdom.The characters were interesting people. Unfortunately, the people were pushed into the background to make room for the treatise on 13th Century engineering. I did not need or want to know the spatial relationship between pieces of a tide-driven mill in the 1200s.The personal relationships were well drawn in the early part of the book. Unfortunately, the characters became tepid over time and were lost in the minutiae of the mill. That said, I enjoy Richard Herley and I hope to read more of his books very soon. Richard Herley - I was born in England in 1950 and educated at Watford Boys’ Grammar School and Sussex University, where my interest in natural history led me to read biology; but from my earliest years English had been my “best” subject, and shortly before my final exams I decided to try to become a professional writer. The job of the artist – in whichever medium he or she works – is an important one, since, conscientiously practised, it helps us to make sense of ourselves and the world.Authorship is not an easy path to follow. I continue to work at the craft and marvel at its subtlety. I prefer a conventional storytelling framework. This offers the greatest potential for the writer: a reader who wants to know “what happens next” is the most receptive and stands to gain the most of all.